BACKGROUND: Akkerendam Nature Reserve is the second oldest proclaimed municipal nature reserve in the Northern Cape, yet to date no vegetation map has been produced. The possible expansion of the reserve is under consideration. METHOD: Braun Blanquet methodology was used to produce a vegetation map. To quantify vegetation change, (1) relevés (a plot of phytosociological data) composed from Acocks' species lists, recorded in 1954 and 1956, were compared with the phytosociological table, and (2) recent repeat photographs (2016) were compared to four images taken by Pole Evans (ca. 1920). RESULTS: Three plant communities were identified within the reserve and expansion area; however, four subcommunities are only found in the proposed expansion area. Relevés compiled from Acocks' species lists were absorbed into the phytosociological table indicating that no significant vegetation change has taken place in the last approximately 60 years. This study found 222 species in common with Acocks' species lists; however, he did not list the alien invasive species Prosopis glandulosa. Comparison of repeat photographs with images taken nearly a century earlier suggests that, except for the impact of recent fires, the composition remained relatively similar. CONCLUSION: The phytosociological approach adopted has provided a map of the vegetation units of the study area, while the historical comparisons indicate that the vegetation of Akkerendam Nature Reserve has not undergone significant change over the last 100 years. The identification, description and classification of vegetation units across the landscape comprise the critical first steps in building a framework for ecosystem management planning (Van der Merwe, Van Rooyen & Van Rooyen 2008a) and provide an understanding of the differences between ecosystems (Chytrý, Schaminée & Schwabe 2011). Additionally, when the expansion of conservation areas is considered, the results of phytosociological studies should assist with planning of these expansions to guide conservation decisions about important, scarce or rare plant communities (Brown et al. 2013). A vegetation map can be used to guide the placement of infrastructure within a protected area to limit disturbance to the natural environment. Predicted impacts of climate change on the environment make the description of the vegetation of an area even more important, as it offers the only record of the current state of the environment. Thus, classifications and descriptions offer baseline information from a plant and animal perspective for assessing the potential changes in the environment that may result from climate change (Clegg & O'Connor 2012). Brown et al. (2013) emphasise the fact that the results of phytosociological studies should not only be the foundation for informed decisions on wildlife management and nature conservation, but also form part of the planning for monitoring changes in cover, structure and composition of vegetation. The active monitoring of vegetation and management of wildlife numbers has recently been highlighted by a long-term study in the Succulent Karoo. This study, conducted over a 40-year period on Goegap Nature Reserve, highlights the fact that animal numbers have to be actively managed with an appropriate decision-making system to avoid degradation of the vegetation (Van Rooyen et al. 2015). Historical vegetation data are of immense value in the assessment of vegetation change over time (Masubelele et al. 2013, 2014; O'Connor, Morris & Marriott 2003; Rhode & Hoffman 2012; White et al. 2016). Numerous valuable data sets compiled by botanists and agriculturalists over the past 60 years exist for many sites throughout South Africa. One such valuable data set was compiled by John Acocks. The Acocks data set (Rutherford, Powrie & Midgley 2003) is important for assessing vegetation change in South Africa because it is comprehensive, it consists of meticulously recorded data and its length of record is unequalled (O'Connor et al. 2003). In addition to the historical vegetation data sets, there are historical photographic records. These images provide evidence of past landscapes and associated vegetation. Repeat photography can be used as an effective tool to quantify vegetation change over time (Webb, Boyer & Turner 2010). This tool requires both the locating and re-photographing of an historical image as well as the interpretation of changes visible in the landscape between the historical and present-day images (Masubelele et al. 2014; Rhode & Hoffman 2012). This is particularly useful for the quantification of vegetation change in protected areas (Masubelele et al. 2013). 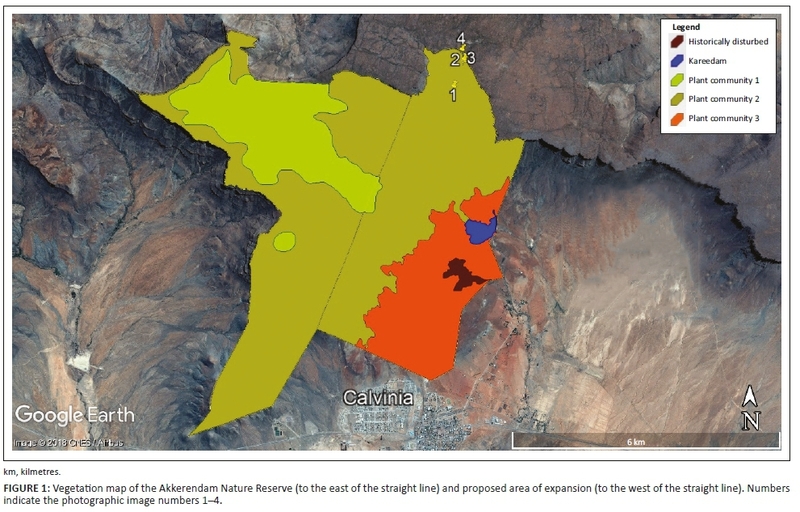 The aim of this study was to (1) produce the first vegetation map, classification and description of Akkerendam Nature Reserve, the second oldest proclaimed municipal reserve in the Northern Cape, and investigate the reserve's possible westward expansion; (2) quantify vegetation change over the past century using (a) vegetation data collected at Akkerendam by Acocks in 1954 and 1956, and (b) historical photographs taken by Pole Evans (ca. 1920). Akkerendam Nature Reserve (AKNR) is the second oldest declared local municipal reserve in the Northern Cape Province (Provincial Notice 153 of 1962) and is situated to the north of the Karoo town of Calvinia, South Africa (Figure 1). This nature reserve (ca. 2750 ha) forms part of the water catchment area for the small town. Currently, the reserve stretches from the edge of the plateau of the Hantam Mountain, down its steep slopes and runs onto a section of undulating foot slopes and flats lying just north of the town. The Hantam plateau is situated within the Fynbos Biome, while the upper steep slopes, undulating lower slopes of the Hantam Mountain and flats to the north of Calvinia are considered Succulent Karoo Biome vegetation (Rutherford, Mucina & Powrie 2006). The reserve is situated in a botanically rich area with some of the earliest references to the Hantam region's botanical wealth dating from the early 1900s (Diels 1909; Marloth 1908). The latest vegetation map of South Africa (Mucina & Rutherford 2006; Mucina, Rutherford & Powrie 2005) indicates the vegetation of the Hantam plateau as FRd2 (Hantam Plateau Dolerite Renosterveld) and the larger area surrounding the plateau as SKt2 (Hantam Karoo). A finer scale vegetation map of the region places the Hantam plateau in the Passerina truncata Mountain Renosterveld association, the slopes of the Hantam Mountain in the Galenia africana - Pteronia glauca Escarpment Karoo subassociation and the flatter plains area in the Calvinia mosaic (Van der Merwe et al. 2008a; Van der Merwe, Van Rooyen & Van Rooyen 2008b). The Calvinia mosaic consists of a subassociation on Ecca shales and dolerite intrusions, and a second subassociation on brackish, historically overgrazed, soils (Van der Merwe et al. 2008b). The reserve is found on land types Da and Ib. Land Type Da refers to land where duplex soils with red B horizons comprise more than half of the area covered by the duplex soils, and Land Type Ib indicates land types with exposed rock, stones or boulder outcrops covering 60% - 80% of the area (Agricultural Research Council 1995; Du Plessis 1987). A mean rainfall of 212 mm per year (1981-2010) has been measured at Calvinia, and a maximum annual rainfall of 379 mm was recorded in 1995 (South African Weather Service 2018). Rains usually fall in winter; however, a few summer thunderstorms also occur. Snowfalls occur occasionally on the high-lying areas, including on the Hantam Mountain, and a mean of one snow day per year over a 30-year period has been recorded for Calvinia (South African Weather Service 2018). Over the same period, temperatures in January reached a mean daily maximum of 31.4°C and in February reached 31.5°C with the coldest months being June and July, with a mean daily minimum of 4.0°C in June and 3.7°C in July (South African Weather Service 2018). The actual boundaries of the originally proclaimed reserve and proposed expansion area were unclear at the time of conducting field surveys in 2013. For the current analysis, the boundaries of the study area were constructed using a combination of different years of Google Earth satellite imagery in an attempt to follow fence lines, where possible and hand-drawn maps acquired from the Northern Cape Department of Environment and Nature Conservation (DENC). Available information on the vegetation and flora in the vicinity of the AKNR as well as environmental parameters, such as topography, land types, geology and drainage, was collected as part of the study. Colour, texture and topography were used to stratify the Google Earth satellite images of the AKNR and proposed area of expansion. This stratification was used to identify broad habitat and/or vegetation types which were surveyed during a field investigation conducted in August and September 2013. One hundred Braun Blanquet plots were surveyed, that is, 68 within AKNR and 32 in the proposed expansion area. Most of the surveys were conducted in a 10 m × 10 m plot, but larger plots (20 m × 20 m) were used in more denuded areas (Rubin 1998; Van der Merwe et al. 2008a, 2008b). Global Positioning System (GPS) co-ordinates were taken at each site, each species present in a plot was noted, and a cover-abundance value assigned according to the Braun Blanquet cover-abundance scale (Werger 1974). Additionally, environmental parameters such as aspect, topography, soil colour and texture as well as percentage rock cover and size were noted. Analysis of floristic data was undertaken using the TURBOVEG and JUICE computer packages (Hennekens & Schaminée 2001; Tichý 2002). The TURBOVEG software was used to capture the vegetation data, and a Two Way Indicator Species Analysis (TWINSPAN) (Hill 1979) was run in JUICE (Tichý 2002). The resulting TWINSPAN analysis of the entire data set of 100 relevés (a plot of phytosociological data) was further refined to obtain clear species assemblages using standard Braun Blanquet procedures. Botanical survey data as well as supporting data such as satellite images, 1:250 000 topocadastral maps, land type maps (Agricultural Research Council 1995) and geological maps (Council for Geoscience 2001) were used to map the vegetation communities. Mosaics of the specific vegetation units were mapped where two or more subcommunities were present in a mapping unit, but where it was not possible to map them separately because of the large variety of vegetation units situated closely together in a small area. Only perennial species were used to classify and describe the vegetation because the annual and ephemeral species are not present or visible throughout the year due to seasonal emergence (Van der Merwe et al. 2008a, 2008b). From 1945 to the early 1950s, John Acocks (1953) conducted a study across South Africa to classify and describe the Veld Types of the country. During this period, he undertook numerous visits to the Akkerendam area and compiled a number of species lists for the larger Akkerendam area. His field notebooks specifically mention 'Akkerendam' and provide a description of the localities of his surveys relative to the Hantam Mountain, its 'krantzes' or plateau and water courses. Acocks compiled nine species lists at various localities at what he termed 'Akkerendam'. Five of the lists were extremely comprehensive and listed between 80 and 250 species. The product of his country-wide surveys was the publication 'Veld types of South Africa' (Acocks 1953) in which he placed the Hantam Mountain plateau into the Mountain Renosterveld Veld Type and the slopes of the Hantam Mountain into the Western Mountain Karoo Veld Type (Acocks 1953). To the south of the Hantam Mountain, he included an area of the False Succulent Karoo Veld Type (Acocks 1953). In subsequent years, the delineation of vegetation maps at various scales upheld these divisions although nomenclature differed (Mucina et al. 2005; Mucina & Rutherford 2006; Van der Merwe et al. 2008a, 2008b). Acocks' species list data from several field notebooks (book 10, p. 102 & 103; book 18, p. 1, 2, 4 & 5; book 19, pp. 37-41, 43-46, 73 & 74, book 20, p. 127 & 138) were used to construct nine relevés for inclusion into the phytosociological table resulting from the 2013 vegetation survey. The abundance of each species in the Acocks data set had been visually estimated by himself in terms of its interplant spacing, ascribing each species to an abundance category (O'Connor et al. 2003), while Braun Blanquet methodology requires species abundances for each species listed. Acocks had a 'rare' category where average plant spacing was between 61.0 m and 91.4 m. This category was awarded a Braun Blanquet cover-abundance value of r, that is, one individual found in a plot surveyed. The remaining species on Acocks' lists were awarded a Braun Blanquet cover-abundance scale value of +, that is, present, uncommon with a crown cover of < 1%. Interplant distances recorded in a previous study by O'Connor et al. (2003) found that interplant distances recorded in that study were never of the scale Acocks recorded. They therefore suggested that the best use of his quantitative data is as an index. Thus, it was considered inappropriate to estimate cover values higher than + for his categorical values. At the generally low levels of vegetation cover found at AKNR, a change in the cover-abundance values did not affect the resulting phytosociological table, that is, even when higher cover-abundance values were used the derived relevés remained within the same plant subcommunity. Additionally, species lists were compiled for the current AKNR and the proposed area of expansion (AKNR expansion area) following the 2013 survey, and a list using the Acocks data (Acocks) was also assimilated. Species presence was compared across all three lists generated. Unknown species belonging to certain genera were kept separate throughout the Acocks data set as well as in the 2013 survey data set. There is a strong probability that certain unknown species would be the same species on the various lists; however, it was decided to keep unknown species separate. Vegetation change was quantified by re-photographing four images first photographed by Pole Evans at four different locations on the slopes of the Hantam Mountain in the AKNR. The subsequent repeat photographs were taken on September 2016. At each of the four locations, environmental data including geology and soils were noted. Major changes evident between the original Pole Evans photograph and what could be seen in the field were noted. Species composition was also recorded for each landform identified in an image. This was done by walking through the landform and noting the cover and composition of the dominant species as well as any features in the landscape that were clearly evident in the photograph (e.g. erosion scars, grassy patches, etc.). The high-resolution photographs were imported into Adobe Photoshop and matched exactly. This enabled a detailed visual comparison of the landscape and vegetation change over time. The abundance of different growth forms and, in some cases, individual plants could be assessed by enlarging each image and comparing the changes that had occurred over time within a particular landform. The phytosociological analysis of all the data (Braun Blanquet data collected for AKNR and the proposed expansion area) resulted in the identification of three broad plant communities, which were further subdivided into 14 subcommunities. The phytosociological table and description of the vegetation units are provided in the online appendices. Only the three major plant communities were mapped and are considered mosaics of the subcommunities identified because of the high spatial diversity on the ground within each given unit (Figure 1). Additionally, the Kareedam was mapped as well as the historically disturbed area in the vicinity of the original Akkerendam homestead. 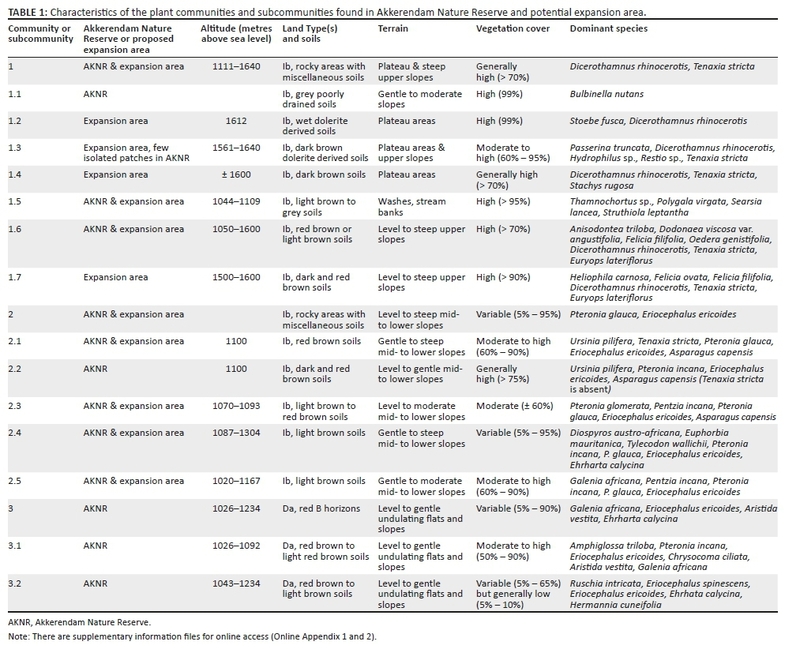 Plant communities 1, 2 and 3 are found within AKNR; however, not all of the subcommunities within these larger communities are found within the current reserve boundaries (Table 1). For example, no or very small localised patches of the Hantam Mountain plateau or upper slopes vegetation (Subcommunities 1.2, 1.3, 1.4 or 1.7 on Land Type Ib) are found within the reserve. The species within the diagnostic species groups of Subcommunities 1.2, 1.3, 1.4 and 1.7 (refer to Online Appendices) are significantly different from the species found in the greater study area, while none of the more general species groups is found within Community 1. In all probability, these species is unlikely to occur in the AKNR because the necessary habitats do not exist within the reserve boundaries. Subcommunity 2.5 (on Land Type Ib) only occurs within the AKNR to a limited extent, and Subcommunities 3.1 and 3.2 (i.e. Community 3, on Land Type Da) are found within the reserve and not within the proposed area of expansion. Acocks compiled nine different species lists following several visits to 'Akkerendam'. These data were used to construct nine relevés to test if such species lists could be incorporated into the phytosociological table produced using the 2013 Braun Blanquet data set. Four of the species lists were short and in the form of additional notes on the area. The relevés constructed from these lists were species poor and inadequate. Five relevés could, however, be produced using Acocks' more detailed species lists. The constructed Acocks relevés were easily incorporated into the phytosociological table using standard Braun Blanquet techniques. A relevé constructed from Acocks' data he referred to as 'Top of Hantamsberg' was placed into Community 1 (Dicerothamnus rhinocerotis Mountain Renosterveld). Two constructed relevés 'further up the main valley' and 'Mountain and S slopes leading up to point of krantz and across to E boundary' could be included into Community 2 (Pteronia glauca-Eriocephalus ericoides Hantam Karoo). His first two field note entries 'Akkerendam: lower slopes' and 'Akkerendam' could be accommodated in Community 3 (Galenia africana-Eriocephalus ericoides Hantam Karoo). This study identified 327 species in the AKNR and 186 species for the proposed expansion area, while Acocks noted a total of 504 species in all his species lists for the greater Akkerendam area. Upon consideration of all the data, a species list of 733 species was produced for the greater Akkerendam area. Fifty-five species (7.5%) were common to all three lists, 142 species (19.4%) were common between the Acocks and AKNR lists and 77 species (10.5%) were common to the Acocks and AKNR expansion area lists. A total of 222 species were common to both the Acocks list and the list compiled in this study. Limited coverage of the foreground in Pole Evans' first photograph does not allow for detailed comparison of this area. In 2016, the foreground was dominated by Anisodontea triloba and Chrysocoma valida (Figure 2). The dominance of A. triloba was in response to the fire which occurred between 1999 and 2002 in the area. Dicerothamnus rhinocerotis and Felicia filifolia are also abundant. In the right foreground of the image, the rocky ridge on dry shale is dominated by D. rhinocerotis, Eriocephalus africanus and Tenaxia stricta with scattered C. valida also present. The fire boundary is evident in the photograph with denser vegetation on the left of the rocky ridge and less dense vegetation on the right of the ridge. The shallow soils and warmer slope result in a lower vegetation cover. However, vegetation cover in 2016 appears higher than in the original photograph. The vegetation on the northwest-facing broken ridge in the mid-ground has changed from a short shrubland with occasional grass tufts in ca. 1920 to a taller shrubland characterised by Dodonea angustifolia, Dicerothamnus rhinocerotis and A. triloba at present. To the left mid-ground of the original image, the west-facing slope is dominated by shrubs. The subsequent photograph indicates that this area is now dominated by grass with the grass, T. stricta, covering 70% of the soil surface. Riverine habitat in the valley bottom is relatively unchanged. Field assessments indicate that it is dominated by Galenia africana and Dodonea angustifolia. The 1920 Pole Evans' image illustrates the dominance of Ficinia nigrescens and Cliffortia arborea (Figure 3). The photograph taken nearly a century later shows that the area is still dominated by these two species. However, vegetation cover is lower as a result of the fire, which occurred on the slope in the period between 1999 and 2002. Additional species include Diospyros austro-africana, Searsia longispina and Stachys rugosa, while Senecio cinerescens, Salvia dentata and A. triloba also occur frequently. This photograph (Figure 4) was taken within 100 m of Figure 3. In the ca. 1920 image there were several large C. arborea individuals present that have disappeared presumably because of fires that have occurred in the region over the past century. The site is now characterised by several seedlings and smaller trees of C. arborea and the population appears healthy given the relatively high levels of recruitment evident in the population. Other dominant species which are clearly visible in the recent photograph are Stachy rugosa, D. austro-africana and S. longispina. This photograph (Figure 5) is located higher up the slopes of the Hantam Mountain. Vegetation cover in the left foreground appears similar in both images and is comprised primarily of D. austro-africana, S. rugosa, Asparagus striata and S. longispina. The composition of the valley slopes and riverine vegetation are described in more detail in the first photograph (Akkerendam image 1, Figure 2), but appear little different between the two time periods. The expansion of the town of Calvinia is clearly evident in the distance. The phytosociological study of AKNR and proposed expansion area resulted in the classification, description and mapping of three plant communities and 14 subcommunities. This vegetation map is the first map produced for this second oldest proclaimed local municipal nature reserve in the Northern Cape. Vegetation maps of natural areas have become indispensable to managers of natural areas (Brown et al. 2013) and should be used to guide conservation decisions upon consideration of potential expansion as in the current case. The inclusion of the proposed expansion area into the existing Akkerendam Nature Reserve will contribute significantly to the conservation significance of the current reserve because these areas include a host of different high altitude habitats (plateau and upper slopes) and thus a different complement of plant species and vegetation units. The Hantam Mountain plateau is well known for its special, and in many cases endemic, species. Mountain Renosterveld areas of the Roggeveld and Hantam Mountains are unique in that they belong to the Fynbos Biome yet exhibit strong Karroid elements (Van der Merwe et al. 2008a, 2008b) because of their close proximity to the Succulent Karoo Biome. The proposed expansion will also include transitional areas, that is, transitional in nature between the Fynbos and Succulent Karoo biomes. These transitional areas are species rich and thus of high biodiversity significance (Van der Merwe & Van Rooyen 2011a, 2011b). In addition to the floral or vegetation component, the formal protection of the upper catchment slopes for rainwater harvesting is an added advantage. The detailed vegetation classification, map and description should also form the basis from which informed and scientifically defendable decisions can be taken for infrastructure and other development in the area (Brown et al. 2013). The vegetation units identified should be used to design a monitoring protocol for the reserve including the placement of additional long-term monitoring sites. The importance of long-term monitoring in conservation areas in Succulent Karoo vegetation has recently been confirmed by a study that found an increase in wildlife numbers resulted in a decline in perennial vegetation, stressing the need for active management of animal numbers to avoid vegetation degradation (Van Rooyen et al. 2015). Vegetation change occurs relatively slowly in arid systems (Cody 2000; Lawley et al. 2013), and monitoring often has to take place over decades to measure significant changes in vegetation. In an attempt to quantify vegetation change in the Akkerendam Nature Reserve, historical data obtained in the form of John Acocks' species lists and photographic images taken by Pole Evans proved to be valuable tools in assessing the nature, extent and key drivers of vegetation change. Acocks' species list data, collected between 1954 and 1956, were comprehensive and enabled the successful reconstruction of five relevés. The ease with which the relevés generated using the Acocks data were incorporated into the 2013 phytosociological table suggests that vegetation has not changed significantly over the past 60 years. Two hundred and twenty-two species were found to be common to both the Acocks species lists and the species list compiled in this study. The fact that the unidentified species in both the Acocks list and the species list generated from this survey were kept separate, therefore not assuming that they were the same species, is probably the reason for the low similarity between lists. Additionally, we are not exactly sure of the precise localities at which Acocks conducted his surveys even though he refers to Akkerendam Nature Reserve or Akkerendam. An interesting finding is that the species lists produced by Acocks are extremely comprehensive, and it is assumed he would have noted all tree species in the greater Akkerendam area. However, the alien invasive Prosopis species does not feature on any of his nine lists of the area. It can be deduced that this species was introduced or became more common following his surveys in 1954-1956. Photographs taken nearly a century ago indicate some change in the vegetation of the Akkerendam Nature Reserve. These changes, however, have resulted primarily from the recent fires, which have occurred in the region. Such fires are known to destroy the vegetation, and although recovery occurs relatively slowly (Van der Merwe & Van Rooyen 2011c) after a decade or more, mature vegetation usually resembles pre-burn vegetation closely in terms of species composition and cover. All the photographs were taken from the slopes (lower and upper) of the Hantam Mountain and indicate the presence of Anisodontea triloba, a species that initially dominates Renosterveld vegetation after fire. In general, an analysis of the matched photographs suggests that the same vegetation is re-establishing following fire and that few major changes in cover and composition are evident in the landscape. Compared with the extensive changes in woody plant cover that have occurred in the eastern and northern savanna areas of southern Africa (Skowno et al. 2017), vegetation change in the Akkerendam area has been relatively minor over the last 100 years. Such stability is consistent with the pattern described for other parts of the Succulent Karoo Biome (Hoffman & Rohde 2007). The authors would like to thank Mandy Schumann (Northern Cape Department of Environment and Nature Conservation, DENC) for her dedication, time and effort in securing funding for this project; and the Hantam Municipality and Akkerendam Advisory Committee for interest and support of their local nature reserve. World Wildlife Fund (WWF) and the Leslie Hill Succulent Karoo Trust are warmly thanked for their financial and administrative contributions without which this project would not have been possible. Mandy Schumann and Conrad Geldenhuys (DENC) are thanked for their inputs into reports provided to WWF. Les Powrie (South African National Biodiversity Institute) is thanked for Acocks' data provided to the authors. H.v.d.M. conducted the vegetation surveys in 2013 and produced the vegetation map and classification. Both authors were present when the images were retaken and the vegetation surveyed in 2016. H.v.d.M. compiled the manuscript with editorial input from M.T.H. This publication was supported by the National Research Foundation in the form of a Research Career Award Fellowship granted to Helga van der Merwe under grant number 91434.